Stars of Four Weddings and a Funeral reunited for the first time in 25 years to help Comic Relief raise £63m. 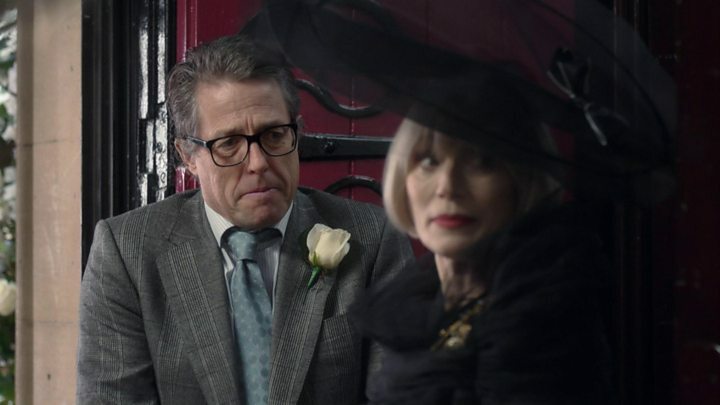 In the mini sequel, Rowan Atkinson returned as the bumbling vicar - this time presiding over the daughter of the two original leads, Carrie (Andie MacDowell) and Charles (Hugh Grant). Miranda, played by Lily James, was seen marrying the daughter of Fiona (Dame Kristen Scott Thomas). The show also saw the return of Keeley Hawes in a Bodyguard spin-off. 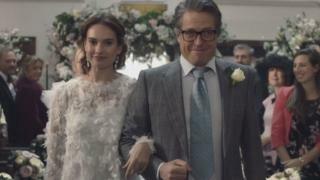 The Four Weddings sketch - One Red Nose Day and a Wedding - also starred Alicia Vikander, who won an Oscar for her role in The Danish Girl, as Miranda's new wife. Sam Smith made a cameo as one of the wedding singers in the short film, presided over by Comic Relief co-founder Richard Curtis, writer of the original film. There were plenty of jokey references to Four Weddings, including its most-quoted line - as Grant's character claimed that he "hadn't noticed" it was raining. The segment featured many of the returning cast - and a special mention was made of Scarlett, played by actress Charlotte Coleman, who died of an asthma attack in 2001. This year's charity show also saw Hawes return as Home Secretary Julia Montague, who appeared to have been killed off during series one, in a sketch for this year's charity show. Her co-star Richard Madden had already been given a new job - protecting a new prime minister played by Joanna Lumley - and was with her in a car when Montague was found in the boot. On seeing Hawes, Madden said: "You're dead." But Hawes asked: "Am I?" By the end of the broadcast, more than £63m had been raised. The last Red Nose Day, two years ago, raised £71.3m by the end of the evening. This year's Red Nose Day telethon also saw a dip in ratings, with an average of 5.6 million people tuning in - 600,000 fewer viewers compared to 2017. The highest amount the event has raised so far was £108.4m in 2011, once all the pledges had been redeemed. The fundraising TV show also featured an appearance from Little Mix - who looked less than impressed when former shadow chancellor Ed Balls had a go at singing one of their biggest hits, Shout Out To My Ex. The chart-topping band and the Strictly Come Dancing favourite were among a number of celebrities who climbed Africa's highest mountain Kilimanjaro to raise more than £2m towards the show's final total. Former England football captain David Beckham again teamed up with James Corden to poke fun at his own previous fashion choices, in a comic video monologue at the start of the night. Jennifer Saunders took part in mock musical Mamma Mia! Here We Go Yet Again, also featuring Sue Perkins, Carey Mulligan, Alan Carr and Gemma Arterton. But One Direction star Louis Tomlinson pulled out of his planned performance following his sister Felicite's sudden death. this week.